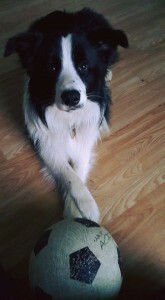 Alfie the Border Collie sitting pretty with her ball! What is the name of your border collie? How did Alfie become part of your family? Alfie came from a lovely breeder, Coussiere Border Collies in Northallerton. Does Alfie have any special talents or tricks? What is the one thing that you love the most about having a border collie as a pet? It was the best decision we ever made making Alfie part of our family, he is a loyal and loving companion. What else do you want to say about Alfie?